Ginger root is one of the most underappreciated and versatile spices around. It's simultaneously hot, sweet, and piquant. It's also a pain in the tush to peel, thanks to its thin, fragile skin and the thick, knotty rhizome that contains all the flavor. We've already shown you that you get a lot more ginger for your money when you peel it with a spoon rather than a knife or vegetable peeler. 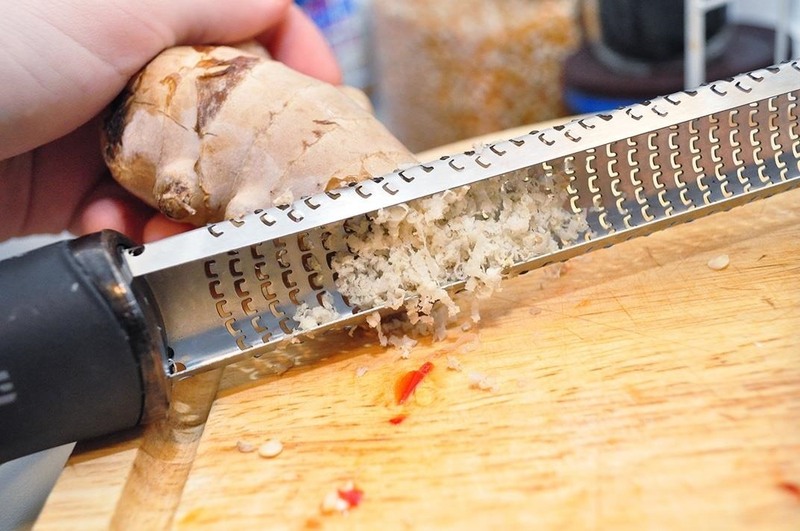 Now it turns out there's another way to make ginger peeling super-easy. Even though I am a big fan of freezing just about any kind of food for later use, I was still surprised to find a giant bag of ginger in my mom's freezer. I was even more surprised to realize that once the frozen ginger had been thawed for a few minutes, it was insanely easy to peel. Sure enough, a little research on the innertubes showed that freezing ginger both for preservation and easier peeling is a common practice, as you can see here and here. 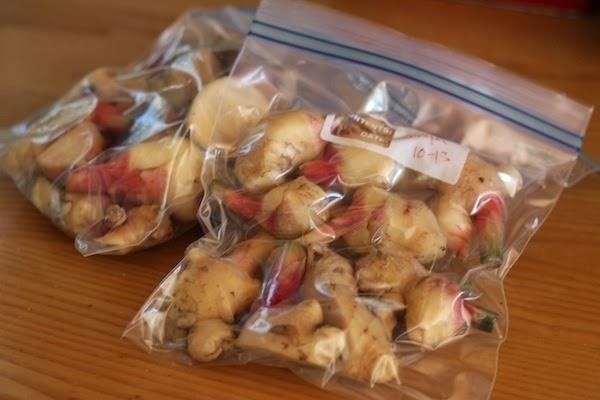 If you need to peel ginger for a meal that day, stick it in the freezer (near the back where it's coldest) as soon as you can and let it chill for at least a few hours. In my very unscientific fashion, I found you need at least two hours or more to really make a difference in how the ginger peels. Let it thaw for about five minutes on the counter once you're ready to peel it. If you're in a real hurry, let it sit in a bowl of cool tap water for about two minutes. Then get out your favorite paring knife or spoon and peel away. Whole frozen ginger, it seems, can last a very long time. The batch from my mother's freezer was at least a month old and was still pretty tasty. I let one batch of ginger sit in cool tap water for three minutes and another sit on the counter for eight. Both peeled very easily once they had softened ever so slightly from their frozen solid state. Plus, frozen ginger is also easier to grate (although more difficult to slice, unless you let it thaw significantly beforehand). So why does freezing make ginger easier to peel? 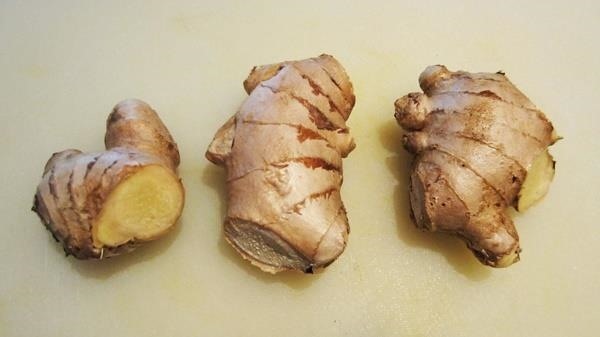 Lifehacker points out that ginger can get fibrous and tough as it ages, and most of us don't immediately peel or use huge quantities of ginger immediately after we buy it. When you freeze ginger, you preserve it in its freshest, best condition, when the rhizome is firm, moist, and not stringy and the skin is crisp and easier to peel. I'd also argue that freezing fresh ginger changes its structure. When fresh food freezes, the water within the food turns into ice crystals and causes a little swelling. As frozen ginger defrosts, the root loses a little moisture, which may make the skin get a little looser, also making it easier to peel. 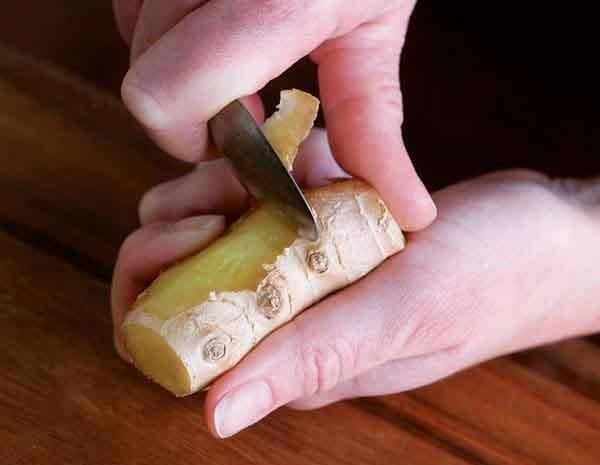 What's your favorite trick for slicing ginger?